* Like his fellow countryman Piet Boon, Marcel Wolterinck has become a household name in interior design. This is his 6th book After 25 years of work, Marcel Wolterinck finds himself an internationally acclaimed designer in the field of interiors, gardens and styling. Moreover, today the Wolterinck label offers a wide variety of designer products. 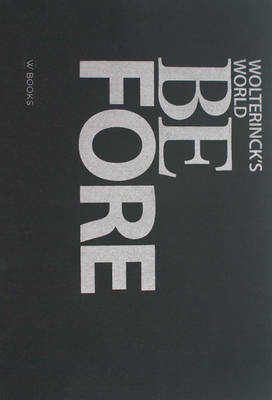 Wolterinck's World BeFore is a stunning and spectacular overview of 25 years of hard labor; from the early days as a florist in Laren, in the center of Holland, until today, as owner of Wolterinck's World. Still based in Laren, he steadily continues to strengthen his international reputation. Clients from all over the world find their way to Laren and Marcel travels the globe to realize projects. For Wolterinck's World BeFore Marcel Wolterinck chose 25 projects as the ultimate representation of his philosophy, that deals with nature, specifically contrasts in material and symmetry. More than 400 images reveal the constant quality of his work during the years.